We Hope for Better Things by Erin Bartels is a one astounding read. This literary debut novel holds so much intensity. I felt the pain, loss, love, and hope. It was like a fresh battle wound that would not fade. A constant reminder of what never died. Still wounds like these exist, today. In this story, I was swept up into the drama mystery of one journalist’s family history. An interracial marriage…back then, it was not looked upon as happy thing. It was seen as a deterioration to society’s rules. Racism was strong then and still is now. People still fight against one another, white versus black. Black versus white. The pressure and troubles that came with the characters’ choices were seen, heard, and lived through these words. It was like being a witness to such cruel times. Despite the cruelty and difficulty, the characters made the most of what they wanted and had. I have complete admiration for the couple who never backed down…and still had hope. Their love was hanging over me on every page. Overall, I would recommend this beautifully told journey. It is full of emotional baggage and hard times. But it showed how strong victims can be despite their challenges. ERIN BARTELS is a copywriter and freelance editor by day, a novelist by night, and a painter, seamstress, poet, and photographer in between. 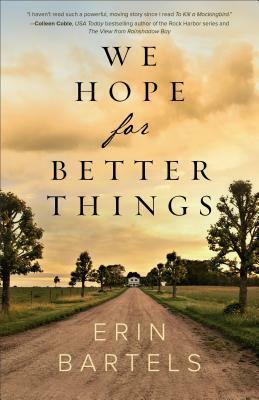 Her debut novel, WE HOPE FOR BETTER THINGS, is scheduled to be released in January 2019 from Revell Books, followed in November 2019 with I HOLD THE WIND, which was a finalist for the 2015 Rising Star Award from the Women’s Fiction Writers Association. Her short story “This Elegant Ruin” was a finalist in The Saturday Evening Post 2014 Great American Fiction Contest. Her poems have been published by The Lyric and The East Lansing Poetry Attack. A member of the Capital City Writers Association and the Women’s Fiction Writers Association, she is former features editor of WFWA’s Write On! magazine. Erin is represented by Nephele Tempest of The Knight Agency. Find her on Facebook @ErinBartelsAuthor, on Twitter @ErinLBartels, or on Instagram @erinbartelswrites.